Helping the Struggling Adolescent is your first resource to turn to when a teen you know is in trouble. Whether you're a youth worker, counselor, pastor, or teacher, this fast, ready reference is a compendium of insight on teen problems from abuse to violence and everything between. Help starts here for thirty-six common, critical concerns. Topics are arranged in alphabetical order. Each chapter gives you essential information for several vital questions: What does the specific struggle look like? Why did it happen? How can you help? When should you refer to another expert? Where can you find additional resources? 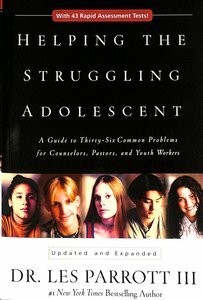 Arranged in three sections, this book first gives you the basics of being an effective helper, Then it informs you on the different struggles of adolescents. The final section--a key component of this book--supplies more than forty rapid assessment tools for use with specific problems. Helping the Struggling Adolescent organizes and condenses biblical counseling issues for teens into one extremely useful volume. Keep it in arm's reach for the answers you need, right when you need them. About "Helping the Struggling Adolescent"
Les Parrott is founder of the Centre for Relationship Development on the campus of Seattle Pacific University and the best-selling author of HIGH-MAINTENANCE RELATIONSHIPS, THE CONTROL FREAK, and LOVE TALK. Dr. Parrott is a sought after speaker to Fortune 500 companies and holds relationship seminars across North America. He also hosts the US national radio broadcast 'Love Talk.' Dr Parrott has been featured in 'USA Today', 'the Wall Street Journal', and 'the New York Times'. His television appearances include CNN, Good Morning America, and Oprah.- Publisher.